Like the VOR approach, an NDB approach can be designed using facilities both on and off the airport, with or without a FAF, and with or without DME availability. At one time it was commonplace for an instrument student to learn how to fly an NDB approach, but with the growing use of GPS, many pilots no longer use the NDB for instrument approaches. New RNAV approaches are also rapidly being constructed into airports that are served only by NDB. The long-term plan includes the gradual phase out of NDB facilities, and eventually, the NDB approach will become nonexistent. Until that time, the NDB provides additional availability for instrument pilots into many smaller, remotely located airports. 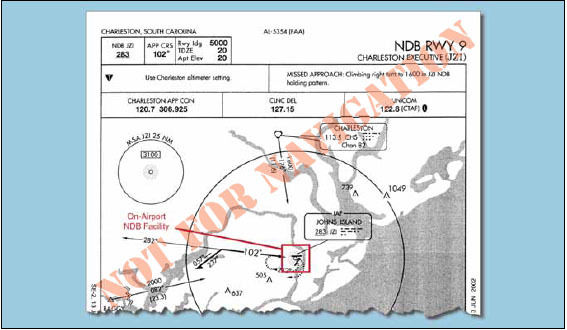 The NDB Runway 9 approach at Charleston Executive Airport, is an example of an NDB approach established with an on-airport NDB that does not incorporate a FAF. [Figure 5-51] In this case, a procedure turn or penetration turn is required to be a part of the approach design. For the NDB to be considered an on-airport facility, the facility must be located within one mile of any portion of the landing runway for straight-in approaches and within one mile of any portion of usable landing surface for circling approaches. The final approach segment of the approach is designed with a final approach area that is 2.5 NM wide at the facility, and increases to 8 NM wide at 10 NM from the facility. Additionally, the final approach course and the extended runway centerline angle of convergence cannot exceed 30 degrees for straight-in approaches. This type of NDB approach is afforded a minimum of 350 feet obstacle clearance. When a FAF is established for an NDB approach, the approach design criteria changes. It also takes into account whether or not the NDB is located on or off the airport. Additionally, this type of approach can be made both moving toward or away from the NDB facility. 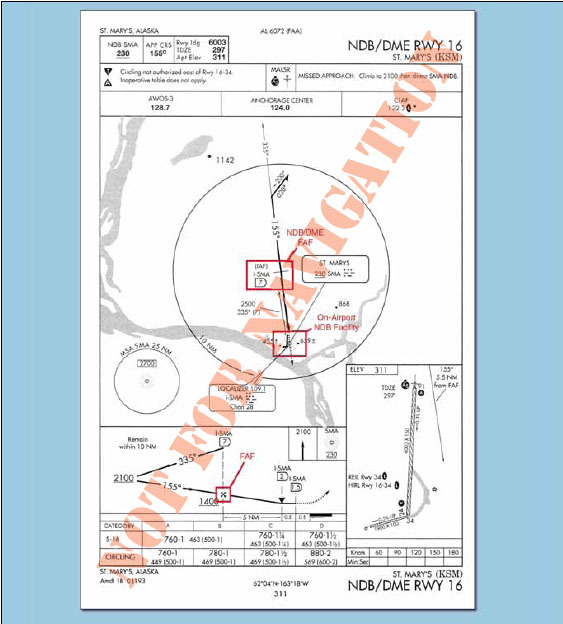 The St. Mary’s, Alaska, NDB DME RWY 16 [Figure 5-52 on page 5-62] is an approach with a FAF using an on-airport NDB facility that also incorporates the use of DME. In this case, the NDB has DME capabilities from the LOC approach system installed on the airport. While the alignment criteria and obstacle clearance remain the same as an NDB approach without a FAF, the final approach segment area criteria changes to an area that is 2.5 NM wide at the facility and increases to 5 NM wide, 15 NM from the NDB. Figure 5-51. Charleston Executive (KJZI), Charleston, South Carolina, NDB RWY 9. Figure 5-52. St. Mary’s (PASM), St. Mary’s, Alaska, NDB DME RWY 16.